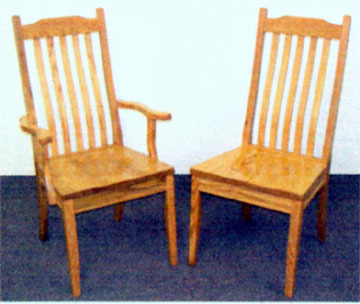 Amish crafted michian shaker style chairs are plain, yet comfortable. Clayborne’s has both the side chairs and the captain’s chairs available for your shaker themed dining room or kitchen. Made by the Amish in your choice of solid oak, cherry, maple or hickory, and available with a variety of stains to match your decor. Fabric seats are available as an option too, but who would want to cover up that beautiful wood finish. Like all products made by the Amish, these chairs are built to last for generations.